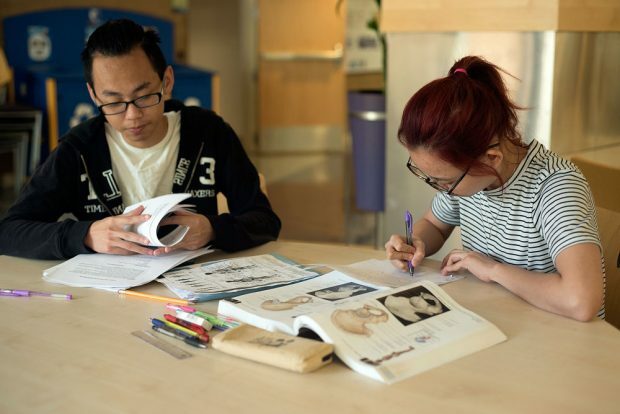 Many students at Salt Lake Community College also juggle jobs and families. To make things more difficult, each student has to find time for homework and study sessions and hope to retain everything they have learned. Regardless of the time of day, every SLCC student has to find a way to manage their busy schedule. Former SLCC student and University of Utah grad Joel Thompson says students just have to do homework when they have time. Thompson, like most students, had to take classes around his work and home life and fit homework in whenever he could. He balanced marriage and a new baby all while attending SLCC full time. Any time he could get off work, Thompson says he was doing homework. SLCC student Jamie Martinez wakes up at 6:30 a.m. to attend classes in the morning. Her daily routine also includes homework in between classes and working a full-time job late into the night. She says she feels “mentally and physically exhausted” by 6 p.m.
Having to study and retain information after she hits that exhaustion wall is a challenge for Martinez, but she says she wouldn’t have it any other way. She loves being a student and says a hot cup of coffee in the morning helps her get ready to learn. Martinez also says that having breakfast every morning helps her grasp the concepts that she is learning more easily. “If I’m starving, I can’t focus. Even a bagel is better than nothing,” she says. Yetzabel Diaz takes morning and night classes at SLCC and also works part-time. She says she feels a little tired around 3 p.m. but gets a second wind as her night class begins. “I’m always up late so why not be at school?” she says. Diaz also says that a good breakfast really helps her study throughout the day and stay motivated to learn. Many students find themselves studying when the rest of their schedule allows. But while the time of day varies from person to person, keeping a regular routine can help students retain what they learn.